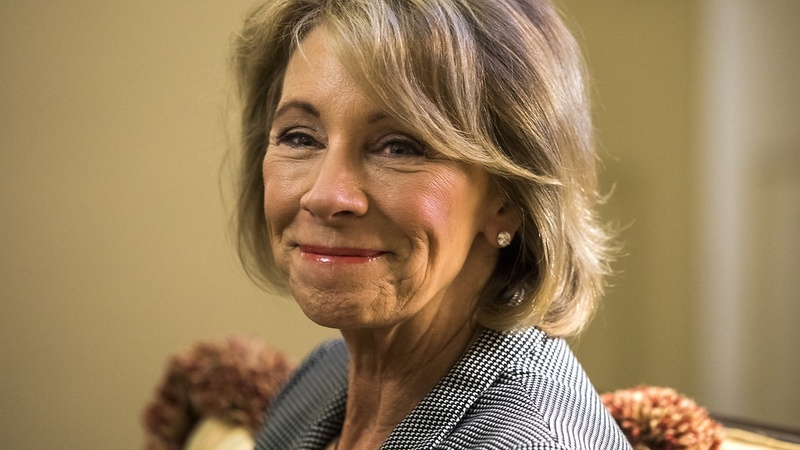 Betsy DeVos was invited to the American Enterprise Institute's USED retrospective, an attempt to figure out what we could have learned from the education policies of Bush and Obama, and her prepared remarks further crystallized her position about public ed and the Core, while also continuing to establish just how little she knows about the system she is nominally in charge of. This is several kinds of disingenuous, since DeVos has spent plenty of time in various back rooms working Michigan's system with all the political clout and checkbook leverage she could muster. "It's been said before" is a nice nod to her boss's rhetorical technique of attributing his own thoughts to the ubiquitous "somebody." And this outsider rhetoric-- sure. I'll bet when a member of DeVos's family has to get a major operation, she says, "Get me a surgeon who's never done this kind of operation before. I want an outsider's view, the view of somebody who doesn't know what you can't do when you're slicing major organs." When she goes out to eat, no doubt she asks for the chef who hasn't cooked before, so her food comes with a real outsider's POV. To a casual observer, a classroom today looks scarcely different than what one looked like when I entered the public policy debate thirty years ago. Think of your own experience: sit down; don't talk; eyes front. Wait for the bell. Walk to the next class. Repeat. Students were trained for the assembly line then, and they still are today. Gah. First, don't think of your own experience, because your own experience is decades out of date (or, of course, in DeVos's case, not even a public school). Why is one premise of so much reformster rhetoric the notion that schools haven't changed a bit since they were students themselves? What evidence is there that schools have stayed locked in amber? Because I'm telling you-- I'm teaching at the exact same school I graduated from in 1975, and things are not the same here. DeVos's highly regimented picture of an assembly line school sounds mostly like a No Excuses charter school, or the beloved Success Academy. The US does spend more per pupil, in raw dollars, than most other countries. But international comparisons of these sorts are complicated, and American spending is similar to countries with similar sized economies. Now DeVos inserts a new point-- that education policy represents a unique unity of goal, that folks from across the aisle and the spectrum, because everyone wants "students to be prepared and to live successful lives." I'd like to believe that's true, but I'm not sure it is. I think what some people want is for the education sector to be opened up so that there are more opportunities to make money. I think what some people want is not to have to pay money to educate Those Peoples' Children. Or at least not as advertised. Again, I suspect that some folks hoped that the federal reform efforts would disrupt public education and make it ripe for privatization. Things worked out pretty well for them. But yes-- for the advertised goals of making education Way More Awesome or at least Raising Test Scores, federal reform has been unspectacular in its results. We should hope – no, we should commit – that we as a country will not rest until every single child has equal access to the quality education they deserve. Secretary Spellings was right to ask "whose child do you want to leave behind." No, no she wasn't. Spellings was a cynical politician, using a cheap rhetorical device to avoid discussing the complete foolishness of the "all students will be above average" goals of NCLB. And I'm going to object, as always, to the use of "access." Everyone on the Titanic had access to a lifeboat, but some were still doomed to drown. But now DeVos will move on to analysis. Why exactly did all those previous policies fail? She does a quick recap, characterizing Bush's NCLB as the stick and Obama's RttT as carrot. NCLB didn't raise test scores, and the SIG money didn't do any good (this is an old point for her, and she continues to draw the wrong lesson from it). So why did they fail, again? You can see where she's going-- it's that damn federal gummint. Ironically, her statement points to an alternate answer (one that she will not examine)-- the continued unsupported, evidence-free assertion that US public schools are failing. She also wants to say that she agrees with Trump that Common Core is Bad (though there's no reason to believe he understands anything about it) and that at the USED, Common Core is dead. I'm not sure what that means. Most states still have some version of the Core in place; does DeVos plan to kill those, too? Or just pretend she doesn't see them? She throws in a great Rick Hess reference here (the federal government is good at making states, district and schools do something, but it's not good at making them do it well) on her way to her bottom line. Educators, parents and students don't need bossy-pants baloney from Washington. Reform shifted emphasis from comprehension to test-passing, damaging the teacher-student relationship. (Also, she will mis-quote some info about teachers feeling disempowered). Education, she says, should be all about the relationship between teachers, parents and students. She notes that federal meddling goes back all the way to the first Bush, and she quotes (inevitably) A Nation at Risk, again missing the opportunity to note that everything she dislikes has been fueled by the same unsupported chicken littling about the awfulness of public schools (a bell that she herself keeps clanging). But we've been doing it all wrong. She will now share three ideas for moving forward and really fixing things, this time. First, she wants us to recognize that the feds can't be the national school board or superintendent (and she blames that idea on the unions). ESSA is a good step, she claims, having apparently missed the part where ESSA keeps focus on the Big Standardized Test. And even states, she says, should resist the urge to centrally plan. States should empower teachers and parents, and I notice again that she is having a real teacher-love day here. Oh, but here comes her big advice to the states, who "have the latitude and freedom to try new approaches to serve individual students." Well, yes. That's simple. Care to elaborate even a little? Embrace the imperative to do something bold... to challenge the status quo... to break the mold. Oh, well. Okay. That clears that up. Is she going to offer any useful specific advice at all? Just one-- make information available to parents about school and teacher performance. Which is the same idea Bush and Obama pushed, the same idea that gave us test-driven education. That mold remains, apparently, unbroken. Second, she wants to empower parents. Like her boss, she builds her case based on who this will piss off, not what good it will do. As support for parental choice grows, "sycophants entrenched in and defending the status quo are terrified." Choice, she says, will always be available for the affluent and the powerful (like, you know, the DeVos family), and so she says (channeling some more Trump), "let's empower the forgotten parents to decide where their children go to school." DeVos sets up her favorite dichotomy-- parental choice, she hears, is never bad for parents or children, but just for the system. The example of the Turpin family, which tortured its children under the guise of a state-approved private school, is a pretty good counter-example. But then, so are the schools of Detroit, where a whole bunch of students were left in underfunded schools so that a few other students could have a choice. Pretending that gutting the system does not have bad effects for th students in that system is one of DeVos's most intellectually dishonest talking points, but she does love it. Third, she wants to rethink school. What does that mean exactly. It seems to mean asking a lot of questions that DeVos thinks nobody has ever asked before. Except that lots of people have asked them before, but because DeVos has that super-special "outrsider" point of view, she doesn't know it. So she thinks that asking about the school day, the school year, pacing-- she thinks these well-studied issues are radical and new. And of course she would also like to ask why we can't just bulldoze public schools, hand every parent a voucher, and just let them all fend for themselves. She throws in a patronizing "I know the unknown can be scary" but does not follow through by wondering if maybe we could know some of these things, or if somebody does already know (because someone who already knows is an insider, so, you know, just shut up). She rings the urgency bell-- students need us to do new things RIGHT NOW! And then she shoots a hole in her argument without even understanding she's done it. Everything else-- our health, our economy, our continued security as a nation-- depends on what we do today for the leaders of tomorrow. It follows, then, that any educator in any learning environment serves the public good. No, that's half right. Education is for the good of the public. That's why bad educators in unhealthy learning environments are a problem. That's why systemic racism expressed in the deliberate underfunding of minority schools is a problem. That's why systems that silence every member of the public who is not a parent are a problem. That's why schools that teach things that are just plain not so are a problem. And that's why agencies that shirk their responsibility to oversee this public good are a problem. If the purpose of public education is to educate the public, then it should... not... matter what word comes before school. This, for my money, is an even dumber statement than the infamous grizzly comment. If the word before "school" is "for-profit" or "flat earth" or "Aryan race" or-- well, good lord, the list is endless. Does she really mean to suggest that as long as it's some kind of school, we're good. After that, it's all over but the Inspirational Closing. First, it takes a special combination of ignorance and hubris to imagine that you are setting a new standard for calling to put students first, as if none of the millions of people who have worked in education never once thought, "You know, I'd rather like to make students my main focus here." While DeVos has scrubbed a lot of the language that used to be her bread and butter-- US schools are so bad they couldn't get worse, and the whole government school system is just a scam created by unions to get fat checks for so-called teachers who just want to do nothing all day-- this line shows some of the old DeVos creeping through. Second, let's think about this. Because the short form of the DeVosian position is, "Here at the Department of Education, we will put students first by doing nothing." That's a neat trick, but it goes with that DeVosian disconnect in which the secretary remains unable to imagine a situation where her department would step in and say, "No, you can't do that" to any school. Does she think that any state or federal agency should have stepped in and said, "No, Mr. Turpin, you cannot open a school where the curriculum is to chain your children in the basement without food and water." And if the answer is no, as it seems to be, then how does she think this works? If her beloved marketplace is free to be overrun by fraudsters, scam artists, and cheats, how exactly are parents empowered? I will say this-- whoever is writing DeVosianj speeches is getting slicker and better at taking off some of the rough edges. But DeVos remains hampered by her ignorance and her desire to dismantle public education. Charters Moving Against the Tide? Is Betsy DeVos a Nothingburger?